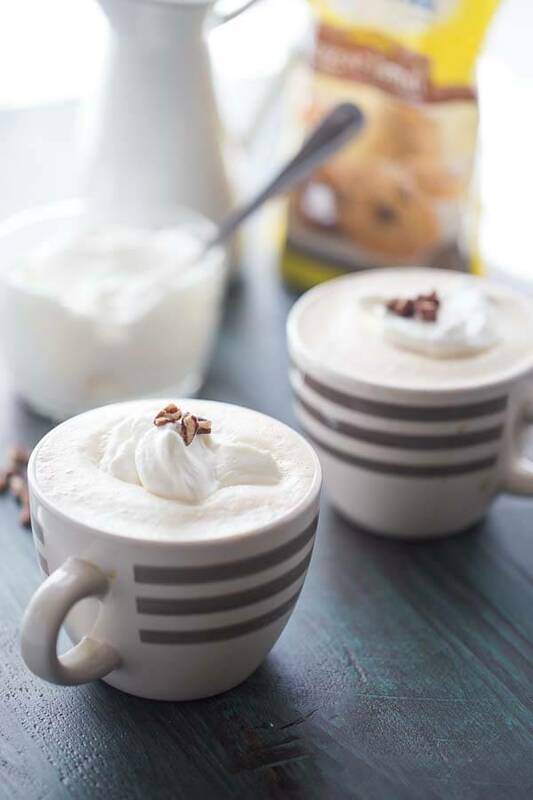 Skip the coffee shop and enjoy a simple and delicious butter pecan latte right at home! I did something the other day that I rarely ever do. I bought a latte. I couldn’t resist; the Pumpkin Spice latte was calling to me. I typically avoid coffee shops because 1. I work from home and 2. I don’t need the extra calories and 3. I’m cheap. But the allure of the nutmeg and cinnamon hit me as soon as I walked into the grocery store. My feet made a beeline for Starbucks without any instruction from my head. When it was time to pay, I handed the barista my money but couldn’t let go. He and I had a mini tug-of-war with my five dollar bill because the cheapskate in me didn’t want to part with my hard earned cash. After finally letting go I had a small bout of buyers remorse that only lasted until my steamy, hot latte was snug in my hands. The thing about latte’s is they are so easy to make at home. You don’t really need any special equipment. I do have a tiny frother, but a whisk or even a blender would work just as well. The best part (aside from saving some cashola) is you control your ingredients! 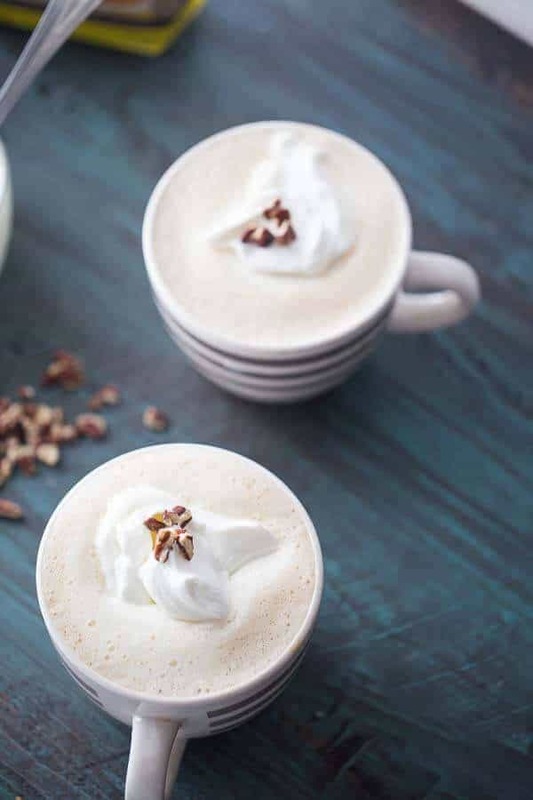 This butter pecan latte is simple and light on the sugar. 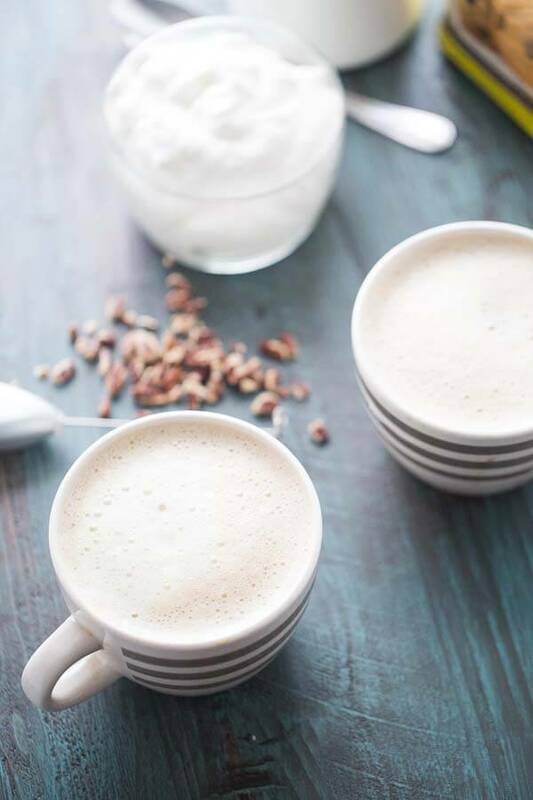 I used skim milk in this latte recipe, but you can substitute your favorite dairy (or non-dairy beverage). I used brown sugar for this recipe because the molasses flavor was needed to create the perfect butter pecan flavor. The butter pecan flavor comes from a combination of butter and nut extract and a splash of maple syrup. 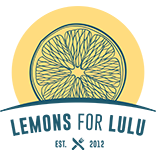 Adjust all the ingredients to suit your taste. You may like your latte’s less sweet. If that’s the case reduce the maple syrup. 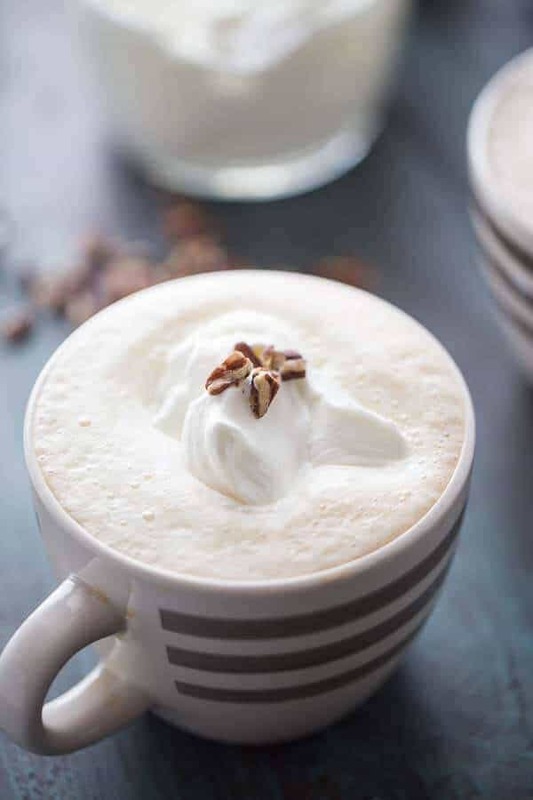 To really give your homemade latte a coffee shop feel, top it off with a dollop of whipped cream and a few chopped pecans. A simple yet delicious tasting butter pecan latte! Whisk together milk, brown, extract and maple syrup until sugar has dissolved. Warm mixture over medium heat until it becomes slightly thick. Be sure to watch your milk mixture, you do not want it to boil. Divide coffee between two mugs. Froth milk with a handheld mixer, frother or a blender. Pour milk over coffee. Top with whipped cream and pecans for garnish. I haven’t given in to the PSL yet, but this looks much better, healthier, and cheaper! I just love how easy lattes are to make at home! This is such a fun flavor too!!! Tanya, Your recipe for Butter Pecan Latte, is “MOUTH WATERING” for sure! The recipe for “Butter Pecan Latte” is FANTASTIC! What a great flavor for a latte! Wish I had one now! You have to treat yourself every once in a while, but always makes you appreciate homemade! Mmm, I wish I could make this right now! It looks delicious and I love that Splenda brown sugar blend! I don’t drink coffee, but for this, I might have to try. Looks scrumptious – thanks for sharing! I’ve never seen butter and nut extract. I’ve searched and all I can find is vanilla, butter and nut. What is the brand name of the product you used? This sounds so yummy and I would love to make it; just not sure what to use for the extract. Thanks!